Left atrial (LA) strain is an emerging technique with potential applications including arrhythmia prediction in atrial fibrillation and early identification of atrial dysfunction. The aim of this study was to evaluate reproducibility of LA strain and strain rate (SR) using multi-vendor analysis software between novice and expert. For LA strain to be a reliable tool, the technique must be reproducible by observers with variable experience. Use of multi-vendor analysis software allows serial strain assessment when echocardiographic images are acquired using different vendors. 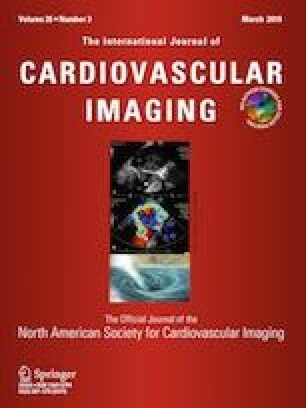 Fifty subjects underwent 2D-Speckle tracking echocardiographic (STE) derived LA strain and SR analysis measured from apical four and two-chamber views. Three strain parameters of LA function were assessed: reservoir (S-LAs, SR-LAs), contractile (S-LAa, SR-LAa) and conduit (S-LAs–S-LAa, SR-LAe). Strain analyses were performed by 2 independent, blinded novice and expert observers using multi-vendor analysis software. Intraobserver and interobserver analyses were performed using intra class correlation coefficients (ICC) and Bland–Altman analysis. LA strain and SR measured by novice observer demonstrated excellent intraobserver reproducibility (ICC for all strain and SR values > 0.88). There was good interobserver agreement of LA strain values between novice and expert (S-LAs:ICC 0.81, S-LAe:ICC 0.82, S-LAa:ICC 0.74). SR values also demonstrated good interobserver agreement (SR-LAs:ICC 0.83, SR-LAe:ICC 0.79, SR-LAa:ICC 0.86). Of all parameters, SR-LAa had the best interobserver and intraobserver agreement (ICC 0.86, 0.96). Global LA strain and SR values were highly reproducible by novice strain reader using multi-vendor analysis software. Interobserver reproducibility between novice and experts were good and acceptable within limits of agreement.